Little Dude and I both have a love for peanut butter and popcorn. So, I thought we should mix them together and see how it goes. 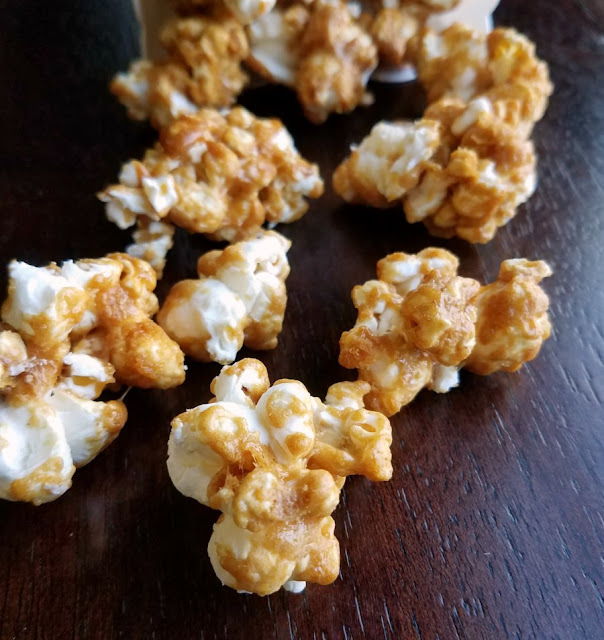 The first time I tried making peanut butter popcorn, I made it using the same idea as Jenny's Smacky Delcious Mix and Grandma Scharnhorst's Microwave Caramel Corn where you use the microwave to dry it out. While that method works great for some things and certainly saves some time, I couldn't get the texture I wanted for this recipe. So I reverted to using the oven like baked caramel corn. Baking it in the oven does take a little bit of time, but it is totally worth it. Besides, it is not active time. You can be doing other things while you wait for the timer to beep. Then it's just a quick stir and back in the oven. Eay peasy! Little Dude LOOOOOOOOVES watching the popcorn pop in the air popper. It is so much fun to have him help pour the popcorn in and then wait for the magic to happen. He enjoys telling me it is hot and can't wait for the popping noise to start. He also likes to help eat the popcorn when it is done. Every time he sees the kernels or the popper, he starts begging! So he really enjoyed making this. All you have to do is pop the corn, make a quick peanut buttery caramel and throw it in the oven for a bit to harden. Ta da! 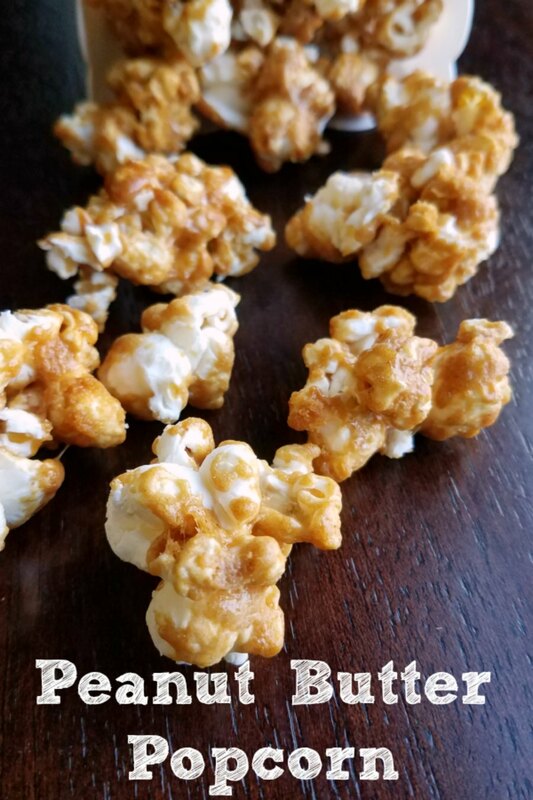 Yummy peanut butter popcorn! Be sure to use a large saucepan when making the caramel. It foams and expands when you stir in the baking soda. Make sure to spread over wax paper while it is still warm otherwise it will harden into one big sheet of popcorn and may stick to the pan. Cool completely before storing to optimal crunchiness and longest shelf life. Want an extra decadent treat? Drizzle with melted chocolate! In a large saucepan, melt butter over medium-low heat. Stir in corn syrup, brown sugar, salt and peanut butter. Cook, stirring frequently until it comes to a low boil. Continue to boil, stirring constantly for 1 minute. Remove saucepan from heat and stir in the baking soda and vanilla. Be careful as the mixture is really hot and it is going to bubble up quite a bit. Pour hot peanut butter caramel over popcorn and toss to coat. 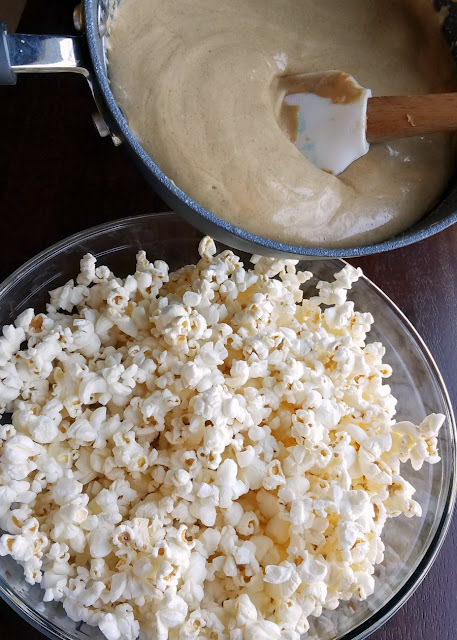 Spread popcorn over prepared baking sheet and bake for 45 minutes, stirring every 15 minutes. 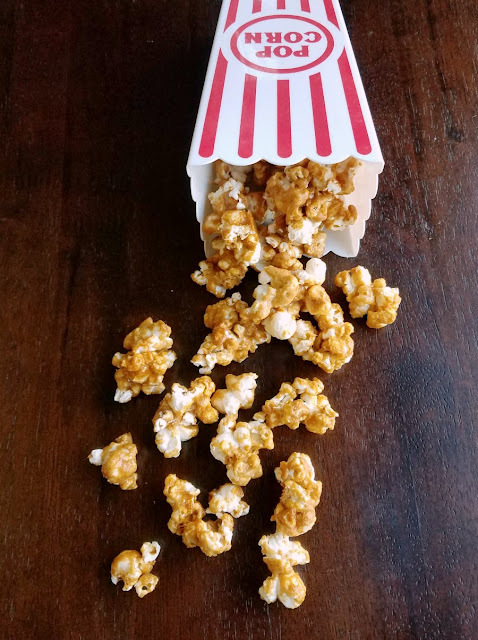 Spread popcorn over wax paper to cool. Once cooled completely, store in an airtight container until ready to serve. Peanut Butter Popcorn sounds like a special treat, I can't wait to try it. Thank you for sharing with the Clever Chicks Blog Hop! I hope you’ll join us again next week! Thank you! We all really enjoyed it! We really enjoyed it. Thanks for hosting! I can't think of anything I'd rather be snacking on right now. Peanut butter and popcorn is always a winning combo! I wish I had more too! It was so good while it lasted! On this stat! Perfect for opening college football this weekend! It is a perfect game day snack! Thanks, Andrea! I have never heard of such a thing! I've been missing out! Love it, Carlee! Then you definitely have to give it a go! Love this! .... and that melted chocolate drizzle sounds like the perfect touch! I am definitely doing that next time! I love the idea of putting it in the oven to harden up, the texture is always the challenge with things like this so great to know the trick! And sounds tasty too. 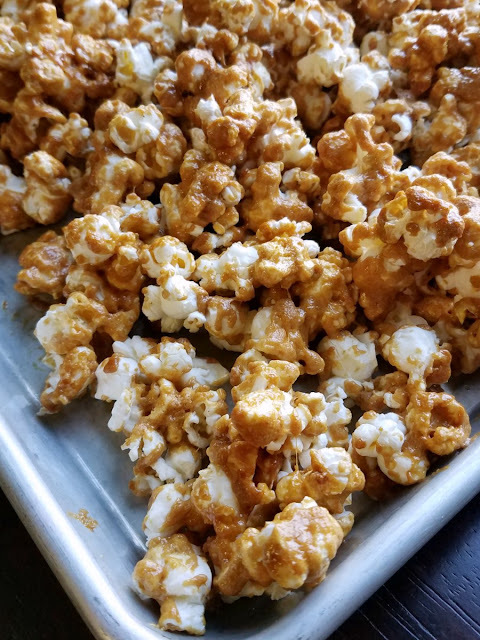 I have always been a HUGE fan of homemade caramel corn. I love the peanut butter twist on this, it would definitely satisfy my salty sweet craving! I am a peanut butter lover, so I might like this version even better than regular caramel corn with I also LOOOOOVE! Love the peanut butter twist! Perfect for tailgating or family movie night. Oh goodness... I just can't make it - I'd eat the whole batch. Sounds soooo good! It is really hard to share! Definitely trying this. Next road trip, this will be in the car with us! We will just love your awesome peanut butter popcorn. Thanks so much for sharing with us at Full Plate Thursday, we sure enjoyed your post! Hi Carlee, seeing recipes like this make me imagine winter nights curled up in front of the television. I do like a sweet coated popcorn and a peanut butter/ caramel coating sounds right up my street. It is perfect for munching while watching some TV. Thanks, Debbie!